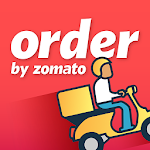 Use Coupon Code LOVEZOMATO to get 20% flat off on your first order (only possible if you pay online please). 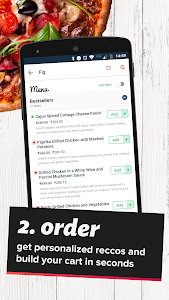 Why does everyone love the zomato order app? – Trusted zomato ratings - choose the right place to order from. – Discounts - directly from the restaurants - starting from 10% off, to upto 50% off. 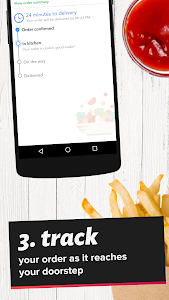 – Live order tracking and express delivery - food always reaches you before promised time! – Order now and find out your own cool new reason to love Zomato! Get whatever you’re craving, from the comfort of your home or office desk – and order food from hundreds of top-rated restaurants near you. 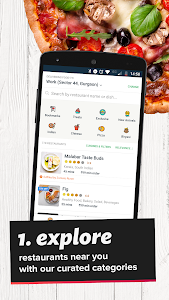 Filter by ratings, cost, cuisine & more, browse through up-to-date and descriptive menus or simply search the dish you’re looking for. Make informed choices – use your trusted Zomato ratings to choose the best place to order from around you. Never make a mistake and order from the wrong place ever again. Save while you’re at it – enjoy exclusive offers and deals on your favourite restaurants! Discounts offered directly by restaurants starting from 10% to upto 50% off. Very low minimum order value for most restaurants. Rs 99 min order value for most restaurants in India. AED 19 min order for most restaurants in UAE. Have fun! If you're ever up past midnight watching TV, and you want to munch on a juicy burger, you can order from a wide range of late-night delivery restaurants; we’re open 24x7! Pay cash on delivery, or use online payment options like debit or credit cards and net banking. We also accept mobile wallets like Paytm and MobiKwik in India. Save your most used addresses to place orders even faster. See your entire order history, and save your favourites to reorder them with a single tap. If it takes you more than 10 seconds to order your favourite North Indian curry-naan meal, you're doing it wrong. Contact our support team using the in-app chat feature if you need any help with your order. Gone are the days of turning red while yelling 'where's my food?' into the phone. 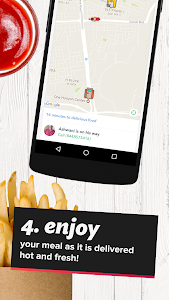 Your favourite fast-food restaurants – Domino’s Pizza, McDonald's, KFC, Subway, Dunkin' Donuts *pauses for breath* Burger King, Box8, Chaayos, FreshMenu, Taco Bell, Pizza Hut...we've got them all. Yay! Please note that FUP applies on the LOVEZOMATO coupon code. The max discount is upto Rs 500 in India, and AED 50 in UAE, and LBP 15,000 in Lebanon. Making the world a better place to eat, one update at a time. Similar to "Zomato Order - Food Delivery App"